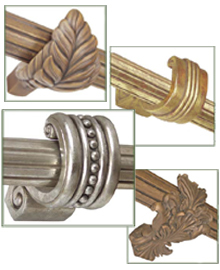 Drapery Hardware and Curtain Hardware accessories including curtain rod brackets, drapery rings, curtain rings, curtain/drapery pulls, baton wands, curtain tie backs, curtain swag holders and other window treatment accessories is offered here. 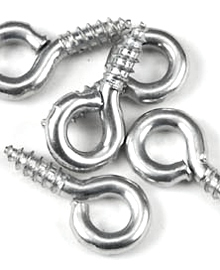 Curtain and drapery hardware accessories including screws, anchors, hooks and more. Needing a last minute hook or wall anchor? Save a trip to your hardware store because you will find the specialty stuff here! Purchase your drapery rod, accessories and hardware all in one place. Screws, anchors, hooks and more are offered here at discount prices to help your achieve beautiful window treatments. Drapery and curtain grommets are typically used to reinforce holes in draperies and shower curtains and can be made of metal or plastic. 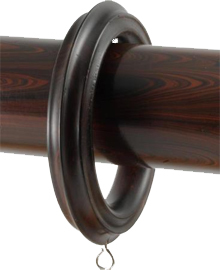 These curtain grommets are offered in a wide variety of finishes, shapes and sizes to create clean, tailored draperies. Curtain grommets are easy to use and add a simple designer touch to your window treatments. Drapery Wands are great for pulling draperies from side to side while protecting your delicate drapery fabrics. 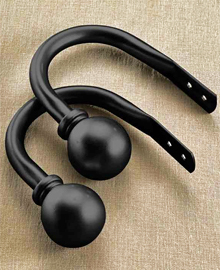 Choose from curtain pulls with rings, swivel snaps or clips. 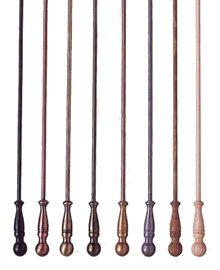 Also known as drapery baton wands, they are perfect for almost every drapery and curtain type where traversing is required. These curtain draws are offered in a variety of materials from wood, fiberglass, metal and plastic and are available in a wide range of lengths for various window heights. Whether shopping for batons that are priced from the very budget end, or for commercial and contract use drapery pulls or for higher end decorative wands you will find them here. Whatever type you need all these rods are used to draw or pull your curtains back. Whether looking for curtain brackets that is traditional or modern in style in wood or in metal or perhaps something in between, the curtain rod bracket you are looking for can be found here. Choose from adjustable to lengths of 1" to 7" projections in a variety of colors and design types. This mixture of drapery brackets and curtain brackets can fit a large number of sized curtain rods and are sure to highlight your window treatments. The curtain rod elbows and swivel sockets contains rod elbows, elbow brackets, hinged elbow joints, swivel sockets and swivel brackets for creating that perfect inside or outside corner turn with your curtain rods. These brackets allow you to fill every inch of your room with beautiful window treatments, even corners! Great for use in bay window curtain rod hinged elbow connections. Curtain Rosettes, drapery medallions and curtain holders are commonly used with a holdback post. Curtain rosettes are an inexpensive way to add a romantic touch to your window treatments while holding them back in a variety of different ways. Curtain rosettes come in a variety of sizes, shapes and finishes and can be used to hold swags, valances, or draperies. Curtain tie backs and curtain hold backs are a great way to hold back thicker drapes and add a nice finished touch to your window coverings. 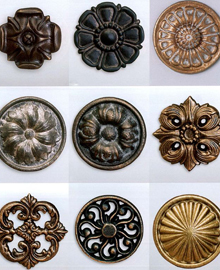 Choose from decorative drapery and curtain tie backs in plain wood, resin, metal, wrought iron, acrylic and more to accesorize your window coverings. Curtain rings and drapery clips with clips and eyelets in both traditional and modern styles. 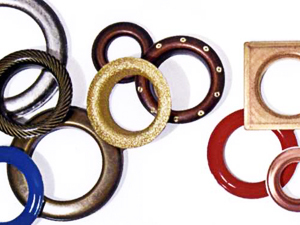 These drapery rings and clips are available in wood, metal, acrylic, plastic, bamboo and more. This large selection of drapery and curtain rings lets you choose the style, type, size and finish for a window treatment that truly reflects your homes decor. 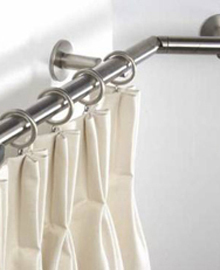 Whether you are looking for a way to support an extra long curtain rod or extend a smaller drapery or curtain rod the Extra Long Curtain Rod Accessories have just the part for you. This extra long curtain rod hardware offers splicing screws, center supports, adjustable brackets, rod extenders and more. 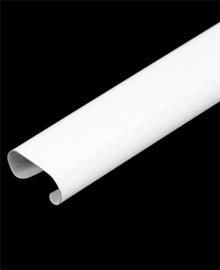 Traverse rod parts and accessories are offered for your traverse curtain rod. 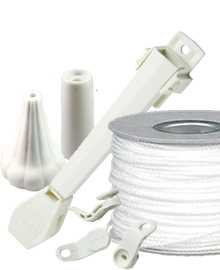 Weighted cord drops, replacement traverse cord, traverse slides, cord cleats, tension pullies and cord guides for your new or exsisting traverse rods can be found in these window treatment accessories for traversing curtain rods. Novel offers decorative nail heads in 35 different styles by the BOX. These decorative nail heads are great for giving upholstery, cornices and window treatments a finished look. Novel offers decorative rhinestone crystals for adding that special bling to your decorating projects. Drapery Hardware and Curtain Hardware accessories including brackets, curtain rings, curtain/drapery pulls, baton wands, tie backs, swag holders and other curtain rod accessories.